Dinosaurs have always been considered truly fascinating creatures. Generation after generation continues to be enthralled with them, and many enjoy researching and learning about each type of dinosaur. Millions of people flock to museums to see life size skeletons of actual dinosaurs and it's exciting to see the shocked and amazed faces of excited children. Many people collect various dinosaur fossils, toys, books, and artwork. Choosing an Albertosaurus and Corythosaurus art print to add to a collection can be a great way of showcasing the love of dinosaurs. Most boys would love to have this exciting print framed and displayed in their room. The Albertosaurus was a fierce predator in prehistoric times. Known to be a carnivore, this species of dinosaur was incredibly fast so it was able to hunt quickly and effectively. The Albertosaurus had similar features of the more common T-Rex, but was a smaller version of that famous predator. The smaller size allowed for a much rapid movement compared to the T-Rex. Because of its specific and popular look, this variety of dinosaur looks amazing on a piece of art. Many children prefer prints to decorate their walls featuring the Albertosaurus because it reminds them of the better-known T-Rex. The Corythosaurus was a much more unusual dinosaur with unique features. It's name means "helmet lizard" and it's easy to see why. The Corythosaurus is known for it's large crest atop its head. Similar to a duck, the crest contained the dinosaur's nostrils and was most likely used for cooling its body, displaying itself to potential mates, and for breathing purposes. The Corythosaurus ran on two legs and was very fast. Although it is known to be a herbivore, the back jaw contained numerous small teeth that were used for grinding up hard plants. This dinosaur is loved because of its unique features and is a favorite of many dinosaur lovers, making this Albertosaurus and Corythosaurus art print a popular one. The two species of dinosaurs were so very different but pairing them together on a piece of art makes for a great conversation piece. The Albertosaurus was an extreme predator who hunted to satisfy it's carnivorous ways. The Corythosaurus was a different type that had bizarre looks and fed on plants. Both were very fast and offered a similar speed and style while running, but they were enemies. Seeing these amazing dinosaurs on an art print makes for a beautiful piece of art. 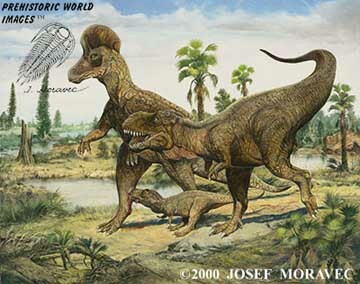 The dinosaurs are perfectly represented using the incredible detail that the artist, Josef Moravec, is well known for. Moravec is a renowned paleo-artist, whose works have been displayed by Natural History Museums throughout North America and Europe. His love of dinosaurs and other prehistoric subjects is reflected in his art, which was heavily influenced by his study of oil paintings by the Old Masters. The colors of the print, reproduced from the original oil painting, can stand up against any famous piece of art. Any dinosaur lover would be proud to display this piece of art.